Did you miss the Yezl Y3 GB? No worries, I managed to arrange a special NotAnotherGB deal with GB. I just received mine from GB, together with 2 x extension tubes, and can confirm that it's true what have been said about this light: Good build quality for the price, throws pretty well, and is quite moddable. + Mechanic tail clicky for turning on/off => No parasitic drain! I heard that the extension tubes fit also HD2010 - would someone please confirm this? 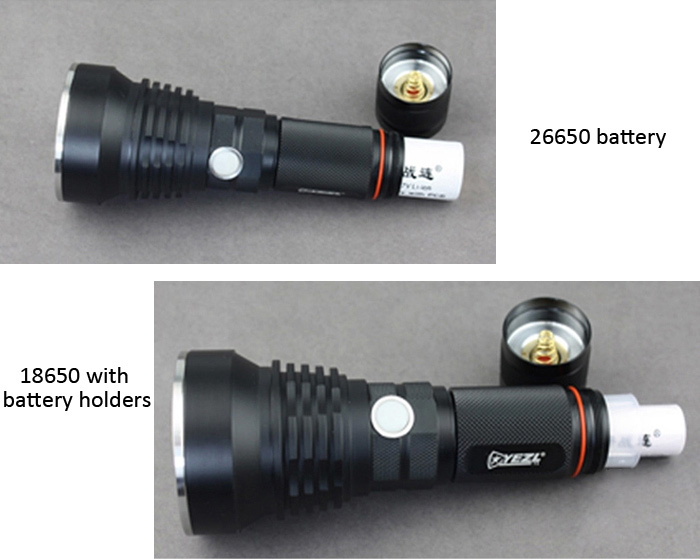 Please note that because of the different discount codes you can't order both light and tube(s) at the same time => Just order the light first and extension tube(s) after that. I tried last night and the extension tubes do fit quite nicely on the HD2010 that I got from Tmart a long time ago. Best wishes on this GB. Would only give one tube with discount code. Tried two but only gave one discount. So purchased one. Then tried to purchase a second. Gave a “Discount Expired” notice. Need second discount code please? Would only give one tube with discount code. Tried two but only gave one discount. So purchased one. Then tried to purchase a second. Gave a "Discount Expired" notice. Need second discount code please? Thanks for informing me. I'll ask them to remove the limitation. They'll probably do it when they come back to work tomorrow.. Thanks for informing me. I’ll ask them to remove the limitation. They’ll probably do it when they coma back to work tomorrow.. Thanks the you are the best! +1 - I fitted it to a HD2010 as well. the - please can you confirm with GearBest they will ship these lights in a box? Too many dings and dangs from the other GB, thinking it was all due to shipping, wrapped in deflated bubble wrap and no boxes. Thanx! Prices look good _the_. All the best for the not another GB. Do I need another? I just ordered an extension, this is a very nice light. the - please can you confirm with GearBest they will ship these lights in a box? At least my samples came in a box. Light in a thick brown cardboard box, extension tubes separately in thinner white boxes. I'll ask GB to confirm. Are prices inclusive of free shipping with TRACKING NUMBER? Also, is there a way for me to order the light and 1 extension tube in 1 transaction only? I tried to do a mock order, I can only use either the fl’s copuon code or the ext tube’s. Also, would you know till when is this special pricing available? the extensions are sold with 18650 spacers ? 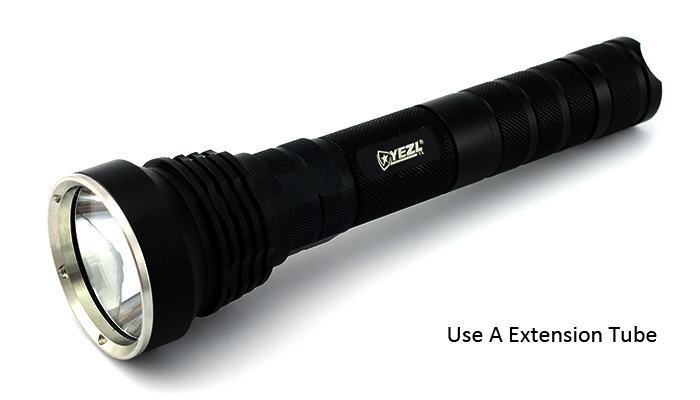 Fixed -> Now you can purchase more than one extension tubes at the same time. No, but you want another. Are prices inclusive of free shipping with TRACKING NUMBER? Also, is there a way for me to order the light and 1 extension tube in 1 transaction only? I tried to do a mock order, I can only use either the fl's copuon code or the ext tube's. Also, would you know till when is this special pricing available? Thanks. Tracking number is free if the order is more than $40. Otherwise it costs +$1.99. The end date is not known, but this won't last forever. Good question. I'll ask them and update here as soon as I get the info. Dang - though I got 3 Y3's around here already, I'm gonna order at least one more, just dunno how many more . I do love this light - overall quality for the price and a HD2010 format but better, and just finished a MT-G2 mod on one using the stock driver, 2 26650 cells, adding a 0805 R100 resistor, and measured 4.6A at the tail with a MT-G2 on a Noctigon, with a UCL/p lens, getting 2,329 OTF lumens and 43.5 kcd measured at 5m. Tom E: Thanks for sharing your mod results! Seems like I need to buy some MT-G2 emitters..
4,6Amps in the tail with 2 cells is it ~9 amps to the led? Code for tubes is still not working for me, 1 for $2.99, 2 for $9.38, 3 for $15.77. MT-G2 is 6v, so 4,6*0,8*8,4/6=5,152a and less @ led? Weird, but just checked and it happens to me too. I informed GB, let's hope they get it fixed soon. I dunno for sure, but thinking ~4.6A, maybe less to the LED. The MT-G2 runs at a higher voltage than a XM-L2, so the voltage output of the 2 cells in series is delivered to the LED, unlike a buck driver for an XM-L2. How this buck driver regulates the MT-G2? No idea... I'm sure there are loss's from the cells to the LED - always is with buck drivers. Might have to order them separately. I was able to order a second tube @ $2.99. Thanks. They fixed the tube coupon, but the FL coupon is still only good for 1 unit. Ordered one. This will be my first Yezl Y3. I think this will be a better hold in my hand than the Small Sun ZY-T08. Thing with these lights is the batteries and charger cost more than the lights. Ordered one with tubes, thanks for the discount the. I think going to let my in-law buy the batteries. I know giving a gift that doesn’t work is strange, but I can’t get myself to buy new batteries! Thanks to the for setting this up. I did miss the other GB from GB. Ordered one plus two tubes. My brother-in-law has been wanting a good cheap thrower to wow his Boy Scout troop on night hikes to spot animals, so he got in on the deal also. Did I read a thread here about some potential slow shipping with GearBest? I never ordered from them before. Shipping from GB has been decent for me. Not as fast as FT or IOS, but not like some people experienced. I’m not sure if it was just people outside the USA, but some people had big shipping delays. Is it a bad idea to use this light with 10 extension tubes? Depends what you want to use it for. Killing spiders on a high ceiling, fine.